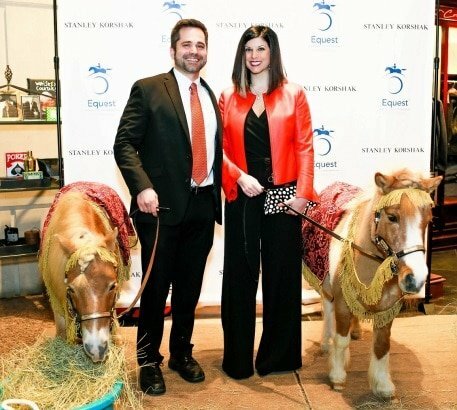 Equest’s largest fundraiser, “Equest Presents Arabian Nights Gala,” will be March 23. Co-Chairs are Annie and Teal Griffeth with Honorary Co-Chairs Cindy Thomas and Bert Headden. The Arabian-themed gala will be held at Sixty Five Hundred event space, celebrating the achievements of Equest. The nonprofit has spent 38-years enhancing the quality of life for children and adults with diverse needs, through the human-horse connection. Guided by Emcee Sonia Azad, WFAA Channel 8 health and wellness reporter, the night begins with a reception. A signature “Wish Granter” cocktail, presented by Reyka Vodka, and additional adult libations will be followed by a seated dinner served by Food Glorious Food Catering. Non-stop entertainment includes live and silent auction items, a not-to-be-missed raffle, tarot card and palm readers, and photo-ops with Equest’s Mini Ambassadors. Energetic performances by DJ Lucy Wrubel and Taylor Pace Orchestra follow, with dancing all night long. This is the first year for the Equest Gala to host Citation Awards. The award is named after the thoroughbred horse, Citation, (April 11, 1945 – August 8, 1970) who won 16 consecutive races in major stakes race competitions. Citation was the first horse in history to win a million dollars. Equest’s Citation Award will go to Connie and Denny Carreker, who demonstrate the same spirit of excellence in support of Equest. Major sponsors include Cindy Thomas and Bert Headden, Louise and Guy Griffeth, Susan Schwartz, Connie and Denny Carreker, Hal and Diane Brierley, Peggy and Carl Sewell and Sewell Automotive Group, Shirley and William McIntyre, Hopkins Commercial, Anna Lou Glass, Lydia and Bill Addy, Lane Cates and Brad McLain, Robyn and Don Conlon, Patty Decker and Mark Arneson, Teresa and Tom Fishman, Annie and Teal Griffeth, Elizabeth Murray, Susie Siller and Nick Olenec, Faith and Garrett Smith, Beth and Jay Staples, Highland Capital Management, My Sweet Charity, Modern Luxury Dallas, Taylor Pace Orchestra, William Noble Rare Jewels, William Grant & Sons – Fistful of Bourbon, Hendrick’s Gin, Milagro Tequila, Reyka Vodka, and Tullamore D.E.W. The Honorary Co Chairs’ involvement with Equest goes back to 1991, when Cindy started as a therapist and began implementing the Hippotherapy (PT/OT) program, which uses the movement of the horse as a therapeutic and rehabilitative treatment and is the core of what Equest does today. Several years later, Cindy met her future husband, Bert, and introduced him to Equest as a client. Since then, Bert has served on the Equest Board of Directors and Finance Committee and continues to provide sound advice and expertise to sustain Equest’s mission. Today, Cindy and Bert continue to support Equest as faithful donors, advocates, and advisers. The Griffeth’s love for their community and dedication to serve led them to Equest. Teal, a commercial broker at Lincoln Harris Properties, is a Dallas native and veteran, having served in the United States Army Special Forces as a Green Beret for seven years before retiring with honor in 2016. Annie is a professional artist whose paintings are displayed in private collections throughout the United States, Japan, and England. She volunteers her time and talent to the pilot art program at Jubilee Park, teaching grades K-8, as well as St. Michael’s Episcopal Church and Lakewood Elementary.